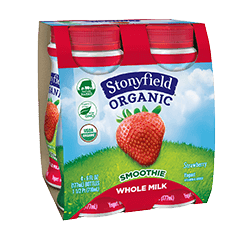 Living a Fit and Full Life: For a Healthy You, Enjoy New Stonyfield Organic Whole Milk Smoothies and Double Cream Yogurt! For a Healthy You, Enjoy New Stonyfield Organic Whole Milk Smoothies and Double Cream Yogurt! So, the two went all-in on yogurt and, over 30 years later, our mission is still healthy. Today, we continue to honor the example our founders set. We’re still here in New Hampshire, just 30 miles east of the old farm. And now, everything we make isn’t just delicious, it’s certified organic – made without the use of toxic persistent pesticides, artificial hormones, antibiotics and GMOs. While we’re at it, we support family farms and take care of the world around us. This satisfying whole milk smoothie is pure peach perfection. Convenient, satisfying and delicious, they will keep you going until mealtime. Convenient. Satisfying. Delicious. These whole milk smoothies will keep you going until mealtime with sun-drenched strawberry goodness. 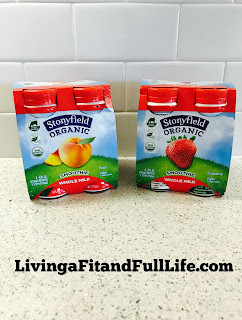 For a healthy you, enjoy new Stonyfield Organic Whole Milk Smoothies and Double Cream Yogurt! I don't know about you guys, but I'm a huge fan of yogurt and eat it just about daily. It's the perfect quick and healthy breakfast for both the kids and I. It's the one thing I don't have to bribe my kids to eat because they always enjoy yogurt. 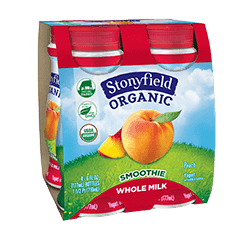 The new Stonyfield Organic Whole Milk Smoothies are delicious and I absolutely love that they're made with whole milk. I'm a firm believer that fat is good for you, especially if it's organic which is why my entire family drinks whole milk. I used to drink skim milk and thought, probably like most that whole milk will make me fat. Not only did making the switch not make me fat but when I would drink whole milk I actually felt full and ate less. It's exactly the same with the new Stonyfield Organic Whole Milk Smoothies! They're extremely delicious and satisfying and my entire family love them! Stonyfield's Organic Double Cream Yogurt is amazingly creamy and oh so satisfying! I love using it as a substitute for sour cream in recipes or adding it to my homemade green smoothies. It the perfect substitute for oil and an excellent way to healthy up some of your favorite recipes! 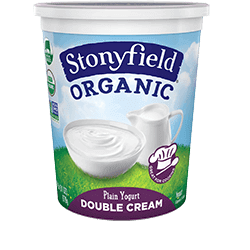 Stonyfield's Organic Double Cream Yogurt is terrific and I highly recommend it! Click HERE to find a store near you that sells Stonyfield! Click HERE to learn more about Stonyfield!